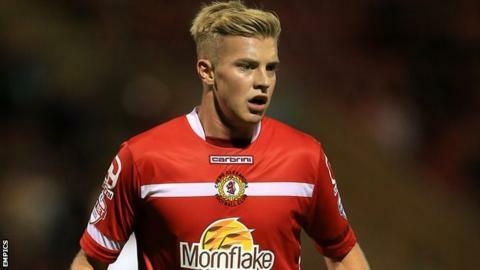 Adam King says he would like to extend his stay at Crewe when his loan from Premier League Swansea City expires in January. Edinburgh-born King, 20, arrived at Gresty Road at the start of the season and scored his fifth goal this term in Saturday's 1-0 win against Oldham. "We've not discussed it yet but it's an option I'd be open to," King told BBC Radio Stoke. "I've loved every second here so far and I'd love to play (in January)." The midfielder added: "It's been a brilliant experience for me so far, coming here and playing for such a great club. "I can't thank the manager (Steve Davis) enough. I'm building on every match and I'm trying to improve different departments of my game." The Railwaymen's victory over the Latics was their second win in a row, lifting them off the bottom of the table and to within one point of safety. "It's been a great week for us and confidence is really high," King said. "We always knew it was possible to beat any team in this league - we played most of them and competed with them even if we haven't got the results. "It just shows what we can do and that we can climb the table."